As I organize any place in my home or one of my client’s homes, I emphasize a balance between function and beauty. The two work together to encourage peace and order. When a space looks good after you have it all organized, then you just get all those happy endorphins of visual satisfaction. And it is a positive cycle from there, because it is a lot more fun to keep up something that looks good! When I was setting up an art station for my kids, I was on the lookout for just the right thing. Though I am not a parenting expert, I have plenty of opinions on the subject! I think that children should have as easy access to art supplies as they do to their other toys, and I think the best place for most art is at the kitchen table. Why the kitchen? I want my children to create any time their hearts desire it, but I want them to do it in a place that is easy to clean up. I prefer the kitchen table, because I can sweep up their little messes easily since I’m already sweeping every day. Plus, it puts a deadline for how long the mess can stay out, since they need to clear the table every day before dinner. Since my children are still young, I only buy the washable versions of art supplies, which wipe up easily with a kitchen cloth. What did I find? The art basket! I’m pretty sure this manufacturer did not have kids art supplies in mind when creating this stacked basket (it was filled with kitchen stuff in the store), but as soon as I saw it I knew just how I wanted to use it. I decided it would be a pretty way of keeping the kids’ art supplies near the kitchen table. The baskets ebb and flow with various art supplies that come into the house and then get used up. The standard contents are always easily visible in the top basket. The standard supplies are crayons, markers, colored pencils, pencils, pencil sharpeners, scissors, tape, glue sticks, envelopes, water colors, paintbrushes, and rulers. The bottom baskets always have paper and stickers, but the other items change. Other contents sometimes include notebooks, activity books, cups for water coloring, etc. Note: I keep play-doh and beads in the game closet and they have to ask specific permission to get those things out (sometimes their timing is right before bed or dinner, when I don’t want the all that stuff dragged out). There is no permission needed for these other art supplies. All art supplies in this basket are for use only in the kitchen! Though my kids know how to make pretty huge messes with the art stuff, keeping it contained to the kitchen table helps us clean it up easily. We’ve used this art basket since we moved in our new house (nearly 8 months now) and it has been awesome. What do you think? 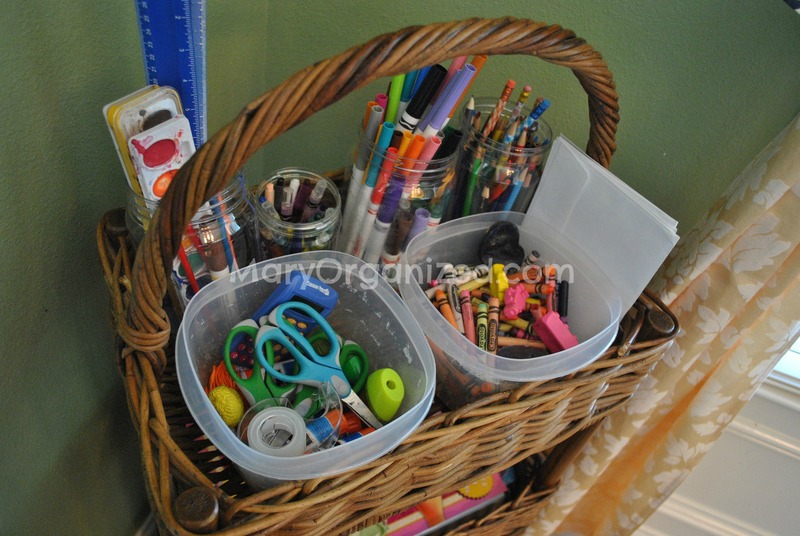 How do you organize your kids art supplies and where do you keep them? I love that the kiddos have a very visual place for their arty stuff. Kids like to please their parents, so I think a lot of them would put up their messes if they actually knew where it was supposed to go. Telling a child doesn’t help, because they easily forget, but the stacked basket is a very visual reminder. In addition, I think it’s pretty evident where each thing goes, so the kiddos will be less likely to just throw all their stuff in one basket without sorting it. 😀 Nice. So true, Liz! My kids love their art basket! I love you art station – it sounds perfect! I actually mention it in Thursday (today’s) post. Any tips on where you found these stacked baskets? Pier 1. They have them in all sorts of wood stains. I think they could also be so fun in a mud area for depositing shoes/winter gear/etc. The sky is the limit! This is my current struggle. The art supplies are taking over the counter nearest the table because we haven’t found a permanent solution. I considered doing what you’ve done with the metal rolling version from Ikea, but with the twins still being so little, I need something just a little less accessible to the tiny duo. I love Christi’s dresser idea though, I’d actually been eyeing the Hemenes, but again, how to keep the tiny tots out of it, lol! I’m going to have to do some more research! Since Cougar has been on the move, I moved the art stuff to the closet. Lol. He would love to draw on my walls! Do you keep additional supplies elsewhere? I love this idea, but there’s no way out rather ridiculous paper collection would fit in that bottom basket! Yes, lots of craft supplies elsewhere, but I just keep what I want them to have access to anytime in the basket.